If you're going to be away from home for a while, who's going to look after the family's flock of chickens? Neighbours, friends and family may be willing to help out but it's quite a responsibility and experienced 'hen sitters' are hard to find. Why not let us help you and give your chickens a break as well? We now offer a chicken boarding service which is available throughout the year. Chickens boarding with us will be kept in 'owner groups', in our extensive fleet of easy clean hen houses, which are made from recycled plastic by Green Frog Designs. 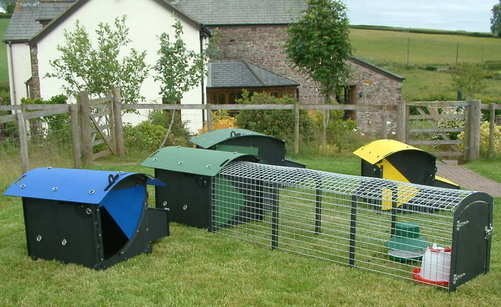 We have houses suitable for between 2 and 8 birds, all complete with biosecure runs. We understand biosecurity issues and that's why we have decided to use plastic houses for our guest chickens, as this enables us to thoroughly clean and disinfect each house between visiting groups of birds. These houses are precision made, waterproof and well ventilated, so our chicken guests will be very comfortable throughout their stay. 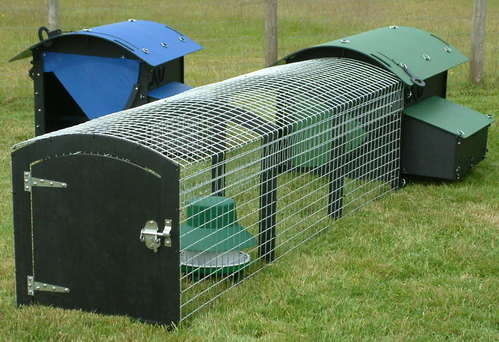 Your chickens will be let out each morning and securely locked up at dusk. We provide all feed, water, corn, grit and bedding. The houses will be cleaned out regularly and each new group is moved onto fresh grass in summer, or disinfected rubber matting during the wetter months. With 20 acres available to us, your birds can be kept separate from other guest birds and our own flock. As you'd expect, they will receive the same care and attention that we apply to all our birds. We are experienced poultry keepers, so your birds will be in safe hands. We are happy to take in Cockerels (within pair's / trio's etc) too - even those bad-tempered ones! For 2017 our rates are £1.35 + vat per bird per night, with a 10% discount for groups of birds staying for 8 nights or more. We charge a modest premium for Xmas, New Year and Easter holidays. There is a minimum charge of £20 + vat per group. Why not take advantage of our optional worming treatment while your birds are with us? We can worm them with Flubenvet for only £2.00 + vat per bird. If they are staying with us for less than 7 days, you can take any unused medicated feed home with you to finish the treatment. If you would like to visit us to see our facilities, we'd be delighted to show you around. Just call to arrange a convenient time. Please click here to read or Terms & Conditions for Chicken Boarding.